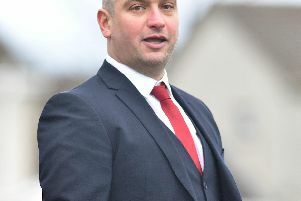 Portadown-born Wesley Boyle has joined Loughgall’s coaching staff following moves at Lakeview Park this week to restructure the management team. Steven Hawe and Stephen Uprichard will remain at Loughgall as joint managers following the decision by Noel Mitchell to take up a coaching role with Danske Bank Premiership-based Ballinamallard United. Boyle will continue to play but Hawe is confident the former Leeds United and Portadown player can add impressive experience to the backroom panel. “Wesley is respected within the game and we are delighted to present him with this opportunity,” said Hawe. “He has strength-and-conditioning training so can bring that to the fitness work when we return for pre-season on July 4. “Noel wanted to take a chance at top-flight football, which is understandable. “Myself and Stephen were delighted to accept the Loughgall committee’s offer of staying on here as joint managers. “We are looking forward to making the most of the chance. “The aim is to bring some stability to the club after last season’s successful relegation fight.